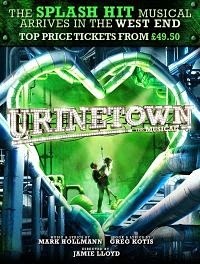 Jamie Lloyd's production of the musical Urinetown which played at the St James' Theatre earlier this year is to transfer into the West End Apollo Theatre from Monday 29th September.with Jenna Russell reprising her performance as Ms Pennywise, with a number of the original St James' Theatre cast returning. Richard Fleeshman will not be there as Bobby Strong due to other commitments but the part will be played by Matthew Seadon Young and Simon Paisley Day will play Caldwell B. Cladwell. Aaron Lee Lambert (Billy Boy Bill/ UGC Executive), Nathan Amzi (Officer Barrel), Mark Meadows (Senator Fipp), Joel Montague (Swing), Julie Jupp(Old Woman / Josephine Strong), Jeff Nicholson (Tiny Tom/ Dr. Billeaux) and Alasdair Buchan, Christina Modestou and Vicky Lee Taylor as Swings.